Artocarpus edulis , "Breadfruit" (Moraceae). From PROTO MALAYO-POLYNESIAN *kuluR, Artocarpus altilis , "Breadfruit" (Moraceae). through PROTO OCEANIC *kulur, Artocarpus altilis. 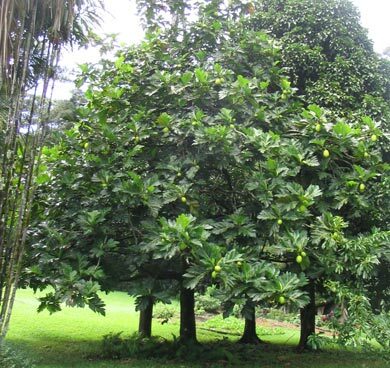 Maori: Kuru, A sheltering fruit tree which grew in Hawaiki, thought to have been Artocarpus altilis. Words derived from Proto Malayo Polynesian *kuluR, like the breadfruit itself, are used in many parts of Southeast Asia and Polynesia. However they are absent in Philippine languages, where the most common term is rimas. 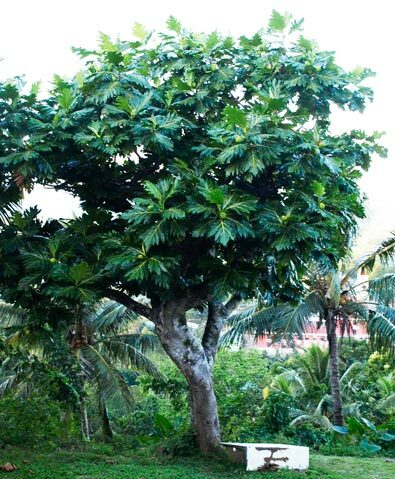 In some Vanuatu, Micronesian and Polynesian languages "breadfruit" is denoted by words inherited from Proto Remote Oceanic *maRi; these include the Tongan and Marquesan words, mei. Lou muamua le ulu taumamao. Pick the breadfruits on the far-off branches first. Proto-Polynesian *Fune "downy, furry; the downy core of the breadfruit"
Samoan: Fune, "male catkin of breadfruit;"
Tokelauan: Fune, "core of breadfruit;"
Tahitian: Hune, "core of breadfruit;"
Tuamotu: Hune, "core of breadfruit or pandanus;"
Rarotongan: 'une, "core of breadfruit." Proto Oceanic *peqe (*mpeqe) "over-ripe"
Tongan: Pe'e, "over-ripe, soft (of breadfruit);"
Samoan: Pē, "over-ripe, soft, easily crushed ;"
Tokelauan: Pē, "rotten, over-ripe breadfruit;"
Hawaiian: Pē, pēpē , "crushed;"
Tahitian: Pē, "decayed, rotten, worn out; ripe (fruit);"
Rarotongan: Pē, "rotten, decayed; over-ripe, soft, easily crushed;"
Proto Austronesian *Belit ~ *bulit "thick, sticky"
Proto Oceanic *bulut ~ *bulit "sap of plant or other sticky substance; be sticky"
Tahitian: Puru, "thick (of liquid); viscous, clotted;"
There is one more Māori word included in the Pollex database which may have "breadfruit" connections. This is Piere "fissure", possibly connected in some convoluted way with Proto Central Eastern Polynesian *Piere "grated breadfruit, banana or taro pudding"; however the Māori word and a Tuamotuan word with a similar meaning are probably the surviving reflexes of a Proto-Tahitic word for "fissue, gap", unconnected semantically with the other *piere. Proto Central Eastern Polynesian *Piere "a pudding made from breadfrui, banana, or taro, baked in tī leaves with coconut cream"
Hawaiian: Piele, "pudding of grated taro, kumara, yam, banana or breadfruit;"
Mangareva: Piere, "breadfruit peeled, wrapped in banana leaf, and baked in oven;"
Tahitian: Pīere, "bananas preserved by drying in the sun;"
Rarotongan: Piere, "'banana figs' - bananas peeled and dried in the sun." Tuamotu: Piere, "split open, gape, hang open ;"
Watch this space for more information about this amazing tree and food crop! Breadfruit (*Kulu) Whole fruit and sections. 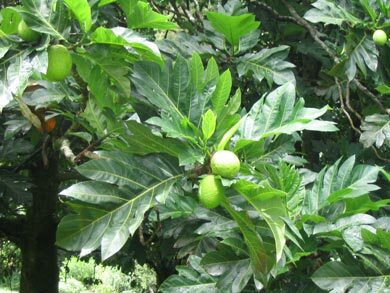 Further information: There is a very comprehensive discussion of words denoting breadfruit in Oceanic languages, as well as information about the tree and its fruit, in The Lexicon of Proto Oceanic, Volume 3 (see Bibliography). 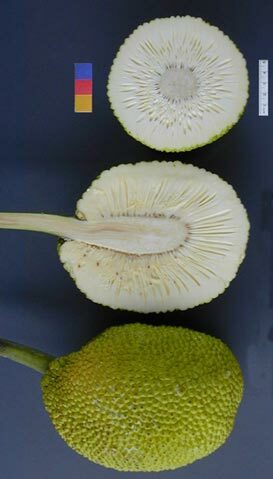 Photographs: Sections of breadfruit: US Pacific Basin Basin Agricultueal Research Centre. Others, R.B.